pauli matrix « Peeter Joot's (OLD) Blog. where takes on the values of the total spin for the (possibly composite) spin operator. Thinking about the spin operators in their matrix representation, it’s not obvious to me that we can just add the total spins, so that if and are the spin operators for two respective particle, then the total system has a spin operator (really , since the respective spin operators only act on their respective particles). Let’s develop a bit of intuition on this, by calculating the energy eigenvalues of using Pauli matrices. We get the and eigenvalues respectively as expected. Geometric Algebra. The very quickest introduction. An attempt to make a relatively concise introduction to Geometric (or Clifford) Algebra. Much more complete introductions to the subject can be found in , , and . The square of a vector is the (squared) length of that vector (with appropriate generalizations for non-Euclidean metrics). Vector products are associative (but not necessarily commutative). That’s really all there is to it, and the rest, paraphrasing Feynman, can be figured out by anybody sufficiently clever. By example. The 2D case. We see that Euclidean orthonormal vectors anticommute. What we can see with some additional study is that any colinear vectors commute, and in Euclidean spaces (of any dimension) vectors that are normal to each other anticommute (this can also be taken as a definition of normal). Here the anticommutation of normal vectors property has been used, as well as (for the first time) the associative multiplication axiom. something that will be familiar to the student of QM, where we see this in the context of Pauli matrices. The Pauli matrices also encode a Clifford algebraic structure, but we do not need an explicit matrix representation to do so. This is illustrated in figure (1). Notice that we have expressed the rotation here without utilizing a normal direction for the plane. The sense of the rotation is encoded by the bivector that describes the plane and the orientation of the rotation (or by duality the direction of the normal in a 3D space). By avoiding a requirement to encode the rotation using a normal to the plane we have an method of expressing the rotation that works not only in 3D spaces, but also in 2D and greater than 3D spaces, something that isn’t possible when we restrict ourselves to traditional vector algebra (where quantities like the cross product can’t be defined in a 2D or 4D space, despite the fact that things they may represent, like torque are planar phenomena that do not have any intrinsic requirement for a normal that falls out of the plane.). In the 2D case, and when the vector lies in the plane this reduces to the one sided complex exponential operator used above. We see these types of paired half angle rotations in QM, and they are also used extensively in computer graphics under the guise of quaternions. L. Dorst, D. Fontijne, and S. Mann. Geometric Algebra for Computer Science. Morgan Kaufmann, San Francisco, 2007. D. Hestenes. New Foundations for Classical Mechanics. Kluwer Academic Publishers, 1999. PHY456H1F: Quantum Mechanics II. Lecture 16 (Taught by Prof J.E. Sipe). Hydrogen atom with spin, and two spin systems. The hydrogen atom with spin. READING: what chapter of  ? where we have independent Hamiltonian’s for the motion of the center of mass and the relative motion of the electron to the proton. The basis kets for these could be designated and respectively. where is the Hamiltonian for the spin of the electron. We are neglecting the spin of the proton, but that could also be included (this turns out to be a lesser effect). We also have higher order terms (higher order multipoles) and relativistic corrections (like spin orbit coupling ). READING: section 28 of . Example: Consider two electrons, 1 in each of 2 quantum dots. where and are both spin Hamiltonian’s for respective 2D Hilbert spaces. Our complete Hilbert space is thus a 4D space. Here we “promote” each of the individual spin operators to spin operators in the complete Hilbert space. The first three kets here can be grouped into a triplet in a 3D Hilbert space, whereas the last treated as a singlet in a 1D Hilbert space. where the and here refer to the spin index . Consider the Hilbert space spanned by , a dimensional space. How to find the eigenkets of and ? Wikipedia. Spin.orbit interaction — wikipedia, the free encyclopedia [online]. 2011. [Online; accessed 2-November-2011]. http://en.wikipedia.org/w/index.php?title=Spin\%E2\%80\%93orbit_interaction&oldid=451606718. Rotation operator in spin space. where we’ve used the fact that . This “rotates” the ket, but introduces a phase factor. Can do this in general for other degrees of spin, for . where and are two non-colinear orthogonal unit vectors that define the oriented plane that we are rotating in. I believe it was pointed out in one of  or  that rotations expressed in terms of half angle Pauli matrices has caused some confusion to students of quantum mechanics, because this “rotation” only generates half of the full spatial rotation. It was argued that this sort of confusion can be avoided if one observes that these half angle rotations exponentials are exactly what we require for general spatial rotations, and that a pair of half angle operators are required to produce a full spatial rotation. The book  takes this a lot further, and produces a formulation of spin operators that is devoid of the normal scalar imaginary (using the Clifford algebra spatial unit volume element instead), and also does not assume a specific matrix representation of the spin operators. They argue that this leads to some subtleties associated with interpretation, but at the time I was attempting to read that text I did know enough QM to appreciate what they were doing, and haven’t had time to attempt a new study of that content. where we are, here, writing for charge on the electron . Question: steady state currents only?. Yes, this is only true for steady state currents. Now, back to quantum mechanics, we turn into a dipole moment operator and is “promoted” to an angular momentum operator. There was a lot of trouble with this in early quantum mechanics where people got things wrong, and canceled the wrong factors of . In fact, Dirac’s relativistic theory for the electron predicts . Richard Feynman compared the precision of quantum mechanics, referring to this measurement, “to predicting a distance as great as the width of North America to an accuracy of one human hair’s breadth”. On tensor product generators of the gamma matrices. The Pauli matrices I had seen, but not the matrices, nor the notation. Strangerep in physicsforums points out that the is a Kronecker matrix product, a special kind of tensor product . Let’s do the exersize of reverse engineering the matrices as suggested. Curious that there are two notations used in the same page for exactly the same thing? It appears that I wasn’t the only person confused about this. A. Zee. Quantum field theory in a nutshell. Universities Press, 2005. Wikipedia. Tensor product — wikipedia, the free encyclopedia [online]. 2011. [Online; accessed 21-June-2011]. http://en.wikipedia.org/w/index.php?title=Tensor_product&oldid=418002023. PHY450HS1: Relativistic electrodynamics: some exam reflection. Charged particle in a circle. 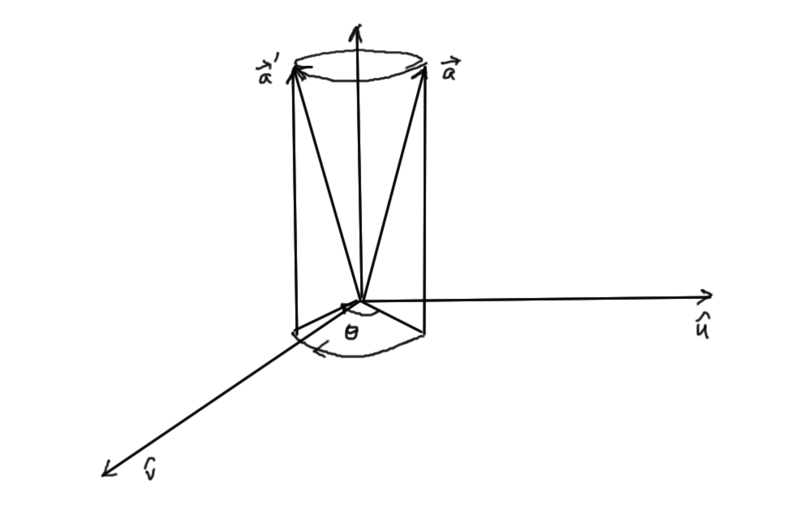 From the 2008 PHY353 exam, given a particle of charge moving in a circle of radius at constant angular frequency . \item Find the Lienard-Wiechert potentials for points on the z-axis. \item Find the electric and magnetic fields at the center. When I tried this I did it for points not just on the z-axis. It turns out that we also got this question on the exam (but stated slightly differently). Since I’ll not get to see my exam solution again, let’s work through this at a leisurely rate, and see if things look right. The problem as stated in this old practice exam is easier since it doesn’t say to calculate the fields from the four potentials, so there was nothing preventing one from just grinding away and plugging stuff into the Lienard-Wiechert equations for the fields (as I did when I tried it for practice). We can do that since the Pauli matrices also have the same semantics (with a small difference since the geometric square of a unit vector is defined as the unit scalar, whereas the Pauli matrix square is the identity matrix). The semantics we require of this vector product are just and for any . I’ll also be loose with notation and use to select the scalar part of a multivector (or with the Pauli matrices, the portion proportional to the identity matrix). There doesn’t appear to be much hope of solving for explicitly in closed form. General fields for this system. Along the z-axis where what do we have? The magnetic term here looks like it can be reduced a bit. An approximation near the center. Unlike the old exam I did, where it didn’t specify that the potentials had to be used to calculate the fields, and the problem was reduced to one of algebraic manipulation, our exam explicitly asked for the potentials to be used to calculate the fields. Now we are set to calculate the electric and magnetic fields directly from these. Observe that we have a spatial dependence in due to the quantities and that will have an effect when we operate with the gradient. In the exam I’d asked Simon (our TA) if this question was asking for the fields at the origin (ie: in the plane of the charge’s motion in the center) or along the z-axis. He said in the plane. That would simplify things, but perhaps too much since becomes constant (in my exam attempt I somehow fudged this to get what I wanted for the case, but that must have been wrong, and was the result of rushed work). (another mistake I made on the exam, since I somehow fooled myself into forcing what I knew had to be in the gradient term, despite having essentially a constant scalar potential (having taken )). The electric field expression above compares well to 1.29. We have the Coulomb term and the radiation term. It is harder to compare the magnetic field to the exact result 1.30 since I did not expand that out. Collision of photon and electron. I made a dumb error on the exam on this one. I setup the four momentum conservation statement, but then didn’t multiply out the cross terms properly. This led me to incorrectly assume that I had to try doing this the hard way (something akin to what I did on the midterm). Simon later told us in the tutorial the simple way, and that’s all we needed here too. Here’s the setup. Here is the frequency of the massless neutrino. The massless nature is encoded by a four momentum that squares to zero, which follows from . When I did this problem on the midterm, I perversely put in a scattering angle, instead of recognizing that the particles must scatter at 180 degree directions since spatial momentum components must also be preserved. This and the combination of trying to work in spatial quantities led to a mess and I didn’t get the end result in anything that could be considered tidy. Lorentz transformation of the metric tensors. These are both symmetric and diagonal, and in fact equal (regardless of whether one picks a or signature for the space). Let’s look at the transformation of the dot product, utilizing the transformation of the four vectors being dotted to do so. By definition, when both vectors are equal, we have the (squared) spacetime interval, which based on the speed of light being constant, has been found to be an invariant under transformation. which given the notation selected would mean that , and justify a notational simplification . This answers the question. We cannot assume that . In fact, in this particular case, we have . Is that a general condition? Note that for the general case, we have to consider compounded transformations, where each can be a boost or rotation. Notes and problems for Desai Chapter V.
Chapter V notes for . Obtain for spin 1 in the representation in which and are diagonal. Note that, like the Pauli matrices, and unlike angular momentum, the spin states have not been considered. Do those have any physical interpretation? A quick calculation verifies that we have , as expected. Obtain eigensolution for operator . Call the eigenstates and , and determine the probabilities that they will correspond to . The normalization constant is . Now we can call these , and but what does the last part of the question mean? What’s meant by ? “I think it means that the result of a measurement of the x component of spin is . This corresponds to the eigenvalue of being . The spin operator has eigenvalue ”. Aside: Question to consider later. Is is significant that ? So, how do we translate this into a mathematical statement? Is that what the question was asking? I think that I’ve actually got it backwards. I think that the question was asking for the probability of finding state (measuring a spin 1 value for ) given the state or . Unsurprisingly, this mirrors the previous scenario and we find that we have a probability of measuring a spin 1 value for when the state of the operator has been measured as (ie: in the states , or respectively). No measurement of the operator gives a biased prediction of the state of the state . Loosely, this seems to justify calling these operators orthogonal. This is consistent with the geometrical antisymmetric nature of the spin components where we have , just like two orthogonal vectors under the Clifford product. Obtain the expectation values of for the case of a spin particle with the spin pointed in the direction of a vector with azimuthal angle and polar angle . So a vector formed with the expectation values as components is a unit vector. This doesn’t seem too unexpected from the section on the projection operators in the text where it was stated that , where was a unit vector, and this seems similar. Let’s now consider the arbitrarily oriented spin vector , and look at its expectation value. (since we don’t have any reason to believe that in general is true). with equality for specific states and orientations only. Also obtain the expectation value of with respect to the state . Sanity checking this we observe that we have as desired for the case. Consider an arbitrary density matrix, , for a spin system. Express each matrix element in terms of the ensemble averages where . In equation (5.109) we had a similar result in terms of the polarization vector , and the individual weights , and , but we see here that this factor can be written exclusively in terms of the ensemble average. Actually, this is also a result in the text, down in (5.113), but we see it here in a more concrete form having picked specific spin directions. Does this really help? I guess not, but it is nice and tidy. Note that as a sanity check we can calculate that as expected. We see that the traces of the density operator and Pauli matrix products act very much like dot products extracting out the ensemble averages, which end up very much like the magnitudes of the projections in each of the directions. Show that the quantity , when simplified, has a term proportional to .